It’s almost springtime! The sun is shining, and it’s feeling a little like a promise of warm summer days to come! I’m looking forward to gardening and playing outdoors more, and wanted to share some of the things that are “blooming” with Alaska Birth Doula. It has been a busy winter, with 16 adorable little doula babies born in the last few months. I am beyond honored to have been included in these pregnancies and births! Thank you so much for putting your trust in me as your doula! I’m still accepting birth doula clients for summer due dates, but spots are limited, so contact me soon if you’re considering hiring a doula for your upcoming birth! March and April are booked, and I have very limited space left for June, July and October. Postpartum services are still available for all summer months, with limited availability in April and May. Do you follow me on Facebook? And Instagram? I’d love to keep in touch! As Alaska’s first and only Certified GentleBirth Instructor, I am thrilled to bring this incredible and innovative childbirth education program to our community! The GentleBirth philosophy combines brain training techniques including Mindfulness, Cognitive Behavioral Therapy, Sports Psychology, and Medical Hypnosis, along with tools, information and techniques to prepare for the most positive birth possible. Workshops are held one weekend a month, or you can always contact me for more information or to arrange a class around your schedule! Register or find more information here. In addition to monthly GentleBirth Workshops, I am also hosting weekly Childbirth Classes on a rotating schedule! These informative, interactive, fun classes and meetups are held every Thursday evening at One Family Community Birth Center. Childbirth education to fit your budget and your life – only $25/class, your birth support person or partner is free! You can join these classes at any time, and take them in any order. Meetups are FREE and all are welcome! Bring those bellies and babies! Are you following the Alaska Birth Collective? From preconception to postpartum and beyond, we’re making connections between caregivers and community. Recent events have included brunch, Pilates for pelvic floor health, Babywearing 101, and much more! We love this community and we want to build it! 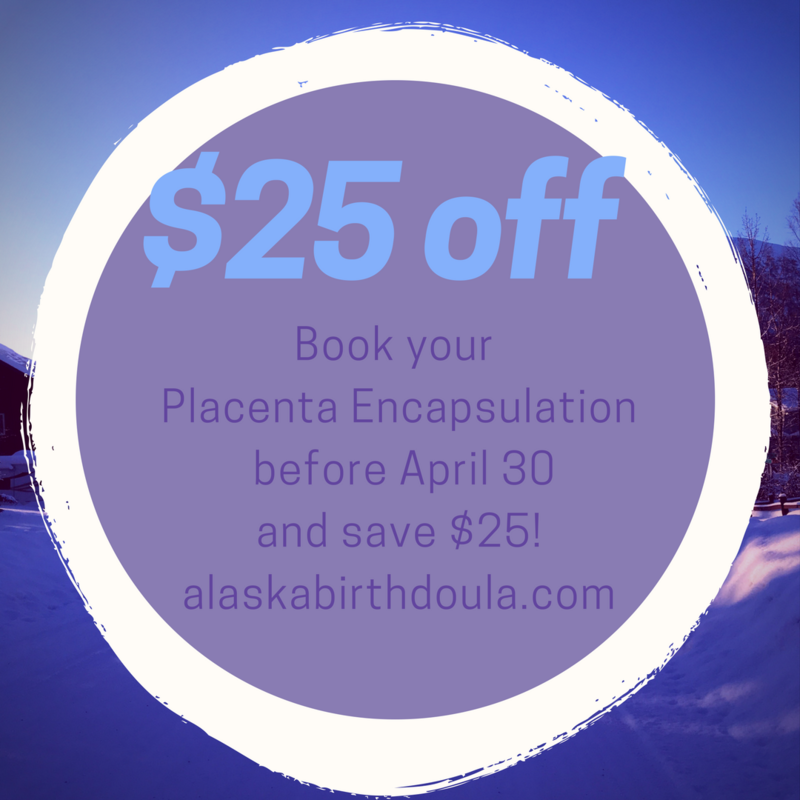 Book any Placenta Encapsulationservice before the end of April and you’ll receive a $25 discount on your package price, no matter your due date! Reported benefits of placenta encapsulation include more energy, higher milk production, lower levels of anxiety, depression, and hormonal challenges after birth, and mood stabilization. You only get one chance at preserving the benefits of your placenta, contact me for more information or to take advantage of this special deal! Have you ever wished you could just sit down with a knowledgeable friend and get the nitty gritty on all things birth? Someone who will tell you all of the ins and outs of hospital procedures, or help you develop your birth plan or pack you birth bag? Maybe you can’t find time in your busy days to take a childbirth class with your partner? Or perhaps someone gifted you a baby wrap, but you have no clue what to do with that insanely long piece of fabric, and YouTube isn’t helping one bit? Do you want to know how your body might really feel and look, and how to prepare for the physical and emotional challenges of new motherhood? Private Birth and Baby Prep Sessions are designed with you in mind. A 3-hour visit with me, a professional, certified doula and childbirth instructor, to talk about you and your baby and all things pregnancy, labor, birth, and postpartum. I offer a discounted rate of $99 if you’d like to visit in my cozy home office in Eagle River, or for $125 I’ll bring all of my supplies, educational materials, and comfort items for labor to you and your birth support or partner in the comfort of your home. These sessions include a full childbirth curriculum plus a workbook that is yours to keep, plus continuing support via phone, email and text during your pregnancy and for as long as you need after your baby arrives. Let me know how I can support you for your best birth!